Hey, I like this poster. I like it a lot. As you can see, Disney has released the movie poster for Karigurashi no Arrietty, in anticipation if its February 17, 2012 theatrical release. They've stayed quiet on the subject for many months, and as the US continues to fall further and further behind on Studio Ghibli's Blu-Ray releases, the fans have remained hopeful, if a little worried. When I look at the poster, I'm struck by the rich color tones and dynamic composition. With an iconic simplicity, you understand what this movie is about and why you should care. It seems to fit into the Disney universe, even though, of course, it comes from Studio Ghibli. Indeed, I suspect that most families who see this poster will conclude that it's Disney's latest animation feature. Notice how little attention is paid to Ghibli; no mention of its director, or even the name Hayao Miyazaki (who, after all, delivered the script and image boards). Fascinating! This is a welcome surprise for me, personally, and I think it's a smart move. As we all know, it's damn near impossible to get Americans to attend a foreign film, and doubly so for animation. Ponyo fought with tooth and claw just to earn $10 million at the box office, and that was a record. The sad truth is that, unless you're associated with one of the major "brand names" (Disney, Pixar, Dreamworks), your animation movie won't go anywhere. This, to me, reflects the design decisions on Disney's Arrietty poster. The title itself neatly evokes memories of "The Wonderful World of Disney," the fonts have that nice, magical quality, even the colors appear more saturated in the American style. This does not appear to be an anime film at all. Now notice the use of lighting and color on the boy's face and the objects in the frame. Doesn't this almost appear to look like...CGI? All of the objects - the sugar cube, the jars, the books - look like computer models and not drawn by hand. Arrietty, of course, is 100% hand-drawn and in 2D, now that Miyazaki has scuttled Ghibli's computer graphics department. Animation lovers loathe to hear it, but the numbers are undeniable: traditional 2D animation doesn't sell in the United States. It's the computer-animated look of Pixar and Dreamworks that sells today, to studio bosses and audiences alike. Even Disney's The Princess and the Frog failed to meet expectations (don't worry, they'll make gobs of money on that franchise). If you want to sell an animated movie these days, especially one without a merchandising empire to build a fan base, then this is the challenge you must face. This tells me that Disney is committed to bring Arrietty to the mainstream. Arrietty is an important Studio Ghibli movie because it marks the beginning of the post-Hayao Miyazaki era. How will Ghibli fare without its legendary founder? Can the new generation of directors carry the torch? What will become of Ghibli's relations with Western distributors? And, most of all, what about Disney? Will Disney continue to support the studio, a Ghibli without Miyazaki, or would they conclude that they really only wanted Totoro and Kiki, and it's time to move on? I think Disney is showing their commitment to the studio, not the man, and that's a very welcome sign. It bodes well for the future. 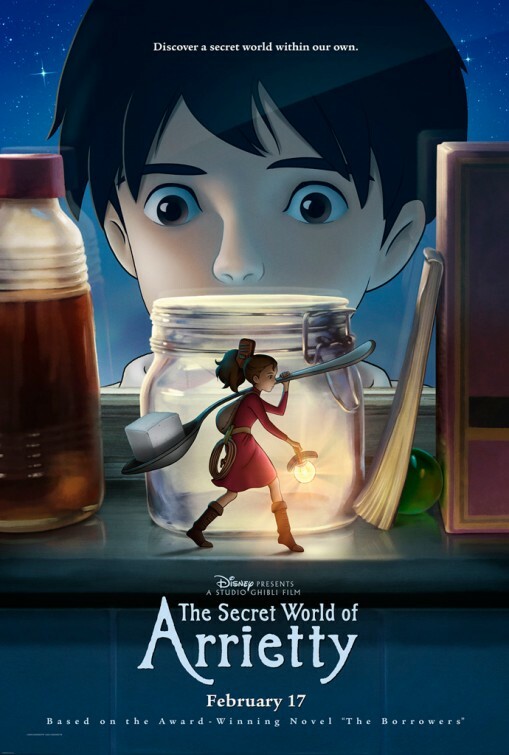 I think Arrietty has the potential to become a hit in the States, a goal that remains frustratingly elusive. Studio Ghibli deserves more than a cult following in the US. It deserves top tier, blockbuster status. Disney appears to agree, and they're going to try once again to reach that goal. All of these elements point in this direction. Good jaerb! Good marketing, but I'm still wondering why is Disney is doing a February release. At least doing a limited December run before opening wide next year would put the film in Oscar consideration, and considering Disney's chances with Cars 2 and even Winnie the Pooh aren't very great at all against Rango and Tintin (assuming it qualifies), Arrietty would have been their best shot. The film's too old to be eligible for the 2012/13 Oscars. And if it's taken so long to get this release ready, when will we see From Up on Poppy Hill (if we see it here at all)? Part of me wants to argue and complain that it doesn't look like original artwork and why does America always get bad cover art / what have you... but *sigh* you are right about American audiences. Odds are the studio won't get much more attention here unless they try to 'trick' the general public into going to see it. It's rather sad. I hope the film does well here, and I really hope we get some more blu-ray releases. Certainly the holiday season is very competitive this year. It is rather a shame they didn't schedule it earlier to get it in for Oscar consideration. And maybe that's why I felt kinda turned on by that poster too. It's not very distant or foreign the way you may look at it or mistaken it for a domestic production the way this poster is handled, and I kinda like the title as I felt it a little more zing to it. "Animation lovers loathe to hear it, but the numbers are undeniable: traditional 2D animation doesn't sell in the United States." "Even Disney's The Princess and the Frog failed to meet expectations"
That's because nobody was rushing out of their homes excited to see another damned Disney princess movie. The reason Americans don't take animation seriously is because it's all made for and marketed to children here. If Disney wants animation to appeal to older audiences then they shouldn't have cancelled Snow Queen and Discworld, what we need is more adult-oriented films like these not more of the same. We got more Princesses, more Winnie the Pooh, people go see these to expecting to entertain their little girls and baby toddlers, not expecting to find interesting compelling stories. So yeah, 2d animation doesn't sell well in the US, but I don't blame Americans, I blame this on Disney's reluctance to try anything new. It's a nice poster... but the boy's pose is kind of off. His eyes aren't looking the right way. It's like he's looking at something off in the distance instead of Arrietty. The pupils should be looking down and in more. And a more natural pose would have his head tilted down a little. Just think how you would look down at something from that position and you'll realize how unnatural that boy's pose is. As is, it's like he's got his head profile up completely vertical and his eyes aren't even looking the right way. It reminds me of a clip I saw of Miyazaki critiquing a younger animator's drawing of a person eating at a desk. Just go through the motion of how you would look down at something in that position and you'll realize how off it is.